Understanding the penalties for not offering adequate coverage under the Patient Protection and Affordable Care Act (PPACA) is tricky for many employers. 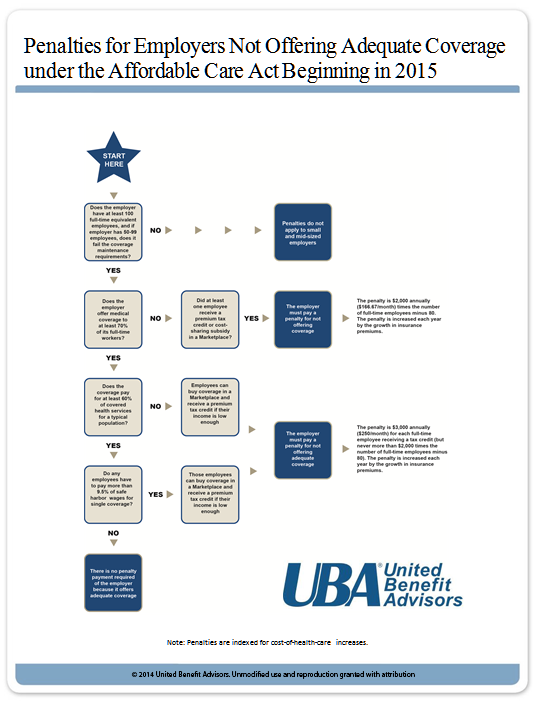 Use UBA’s chart below to see if your company will have to pay a penalty. For further information about the health care reform requirements for your business, download UBA's complimentary guide, "PPACA Compliance and Decision Guide for Small and Large Employers" from the PPACA Resource Center at http://bit.ly/1nHbaWv. If you are not sure if you are a large or small employer under PPACA, request UBA’s Counting Employees Under PPACA.